Samuel is an associate attorney with Kirsh & Associates, Ltd., where he practices exclusively in the area of domestic relations law. 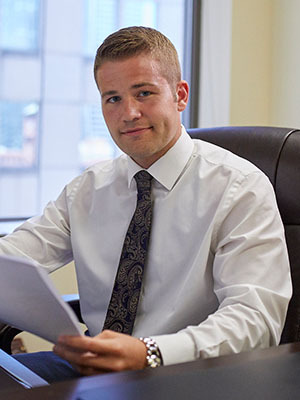 Samuel first started at Kirsh & Associates, Ltd. as a law clerk in 2012 and continued in this role through law school until his admission to the Illinois Bar in the spring of 2016, at which time he transitioned into the position of associate attorney. Samuel is a native of Lombard, Illinois. He graduated from the University of Illinois Urbana-Champaign with a Bachelor of Science in Psychology and a Minor in Business. After graduation, Samuel went on to earn his law degree from the Chicago-Kent College of Law in 2016. While in law school, Samuel was on the Dean’s Honor List and received the CALI Award for the highest grade in Legal Research & Writing III and Commercial Law: Payment Systems. Additionally, Samuel earned a Certificate in Litigation and Alternate Dispute Resolution, and received his mediation certification with Chicago’s Center for Conflict Resolution. Samuel’s career goal is to combine his background in psychology with his legal education in order to help people through a difficult period in their lives. He believes that his role as “counselor-at-law” is as important as his role as attorney-at-law.